There’s a bench just outside UMBC’s Public Policy building. It’s a quiet, unassuming bench. But if you take a moment to read its engraved plaque, you’ll see there’s a story behind that bench — a story about a man named Jim Kruger. Jim is a 2013 graduate of UMBC, but in many ways, he’s very different from his classmates. For starters, Jim’s a grandfather. He came to UMBC through Maryland’s Golden ID program, which helps people over 60 return to school to earn or complete a degree. When he graduated from high school, Jim went straight to the Community College of Baltimore County. But, in the way that it does, life happened. Jim and his wife Kathy got married and had kids. As any parent knows, working and raising a family takes time and energy, and so Jim left school to devote himself to raising his beautiful family and running his own business. But as his kids got older and he moved into retirement, Jim had an idea. Jim found that he loved being in the classroom. In particular, he enjoyed the wide range of perspectives and experiences that his classmates brought to the coursework. He found himself with a whole new group of friends and mentors. Jim also got involved outside the classroom. “I took advantage of the full range of the UMBC experience,” he says. He and his wife regularly attend theatre productions and he likes to take his grandsons to basketball games. It’s no surprise how integral he became to the UMBC community. When Jim walked across the stage to receive his diploma in May 2013, Kathy knew she wanted to commemorate the occasion with a meaningful gift. 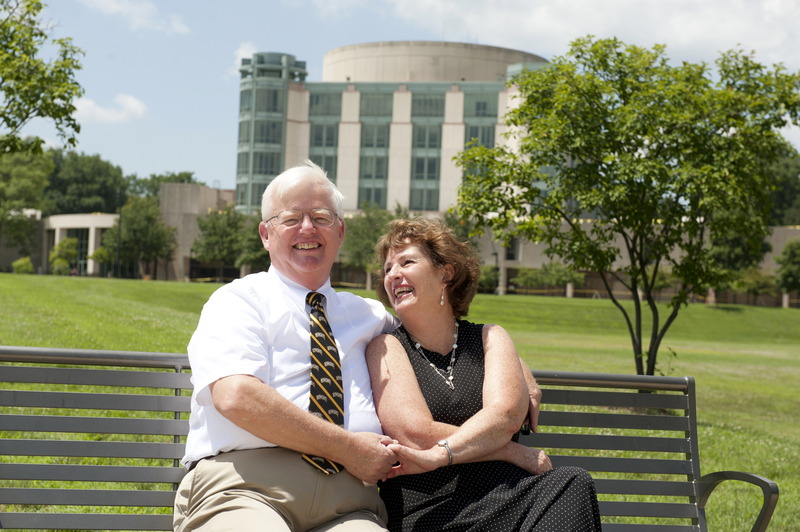 She settled on a bench, which would beautify the campus and give Jim a place to rest when he was walking between classes, since he had decided to continue on as a graduate student at UMBC. Learn more about how you can invest in UMBC.